For thousands of years, prior to modern development that began less than 200 years ago, the Bassett Creek watershed was home to abundant plant and animal life, and provided a clean water source to the Mississippi River. Today, for the last mile and a half of its journey, the creek has been diverted into a huge concrete storm sewer beneath downtown Minneapolis, Minnesota. 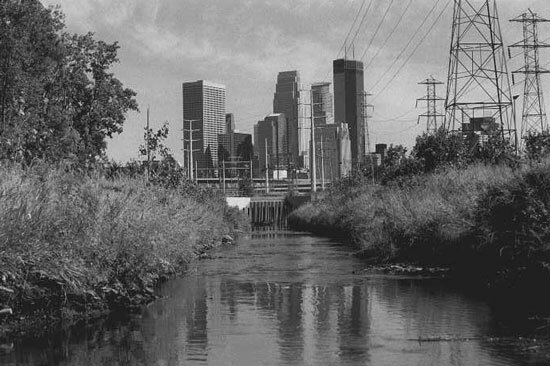 By the time it reaches the Mississippi River, Bassett Creek is, like many urban creeks, contaminated by polluted runoff. This runoff contamination comes from rainwater flowing off industrial sites, roads, chemically treated lawns, buildings, parking lots and other types of manmade surfaces that now cover much of the watershed. The Bassett's Creek watershed restoration efforts have a vision to restore some of the natural creek meandering and adjacent natural features such as flood plains, wetlands, wet meadows and native vegetation. Adjacent public parkland and walking paths for human enrichment is part of the vision. Very important also is the desire to improve the water quality of this Mississippi River tributary. These efforts are supported by the Friends of Bassett Creek, and welcome the involvement of representatives of businesses, government, non-profit organizations, area residents, and all interested citizens. Take a look at the sections below to find out more about Bassett Creek, the Bassett's Creek watershed restoration efforts, and what you can do to get involved in restoring this once-vital natural area.